By now many people would have heard about the earthquake in Italy that happened 2 weeks ago. Massive damage has been reported in the town of Amatrice - the birthplace of the classic pasta sauce all'amatriciana. As a response to what happened, a number of restaurants in town have decided to help the disaster relief effort by donating all or part of the proceeds from serving their pasta all'amatriciana during a promotional period. Giando is one of these restaurants which pledged donations, and they are offering to donate 100% of the HKD 188 they receive from customers on the dish. 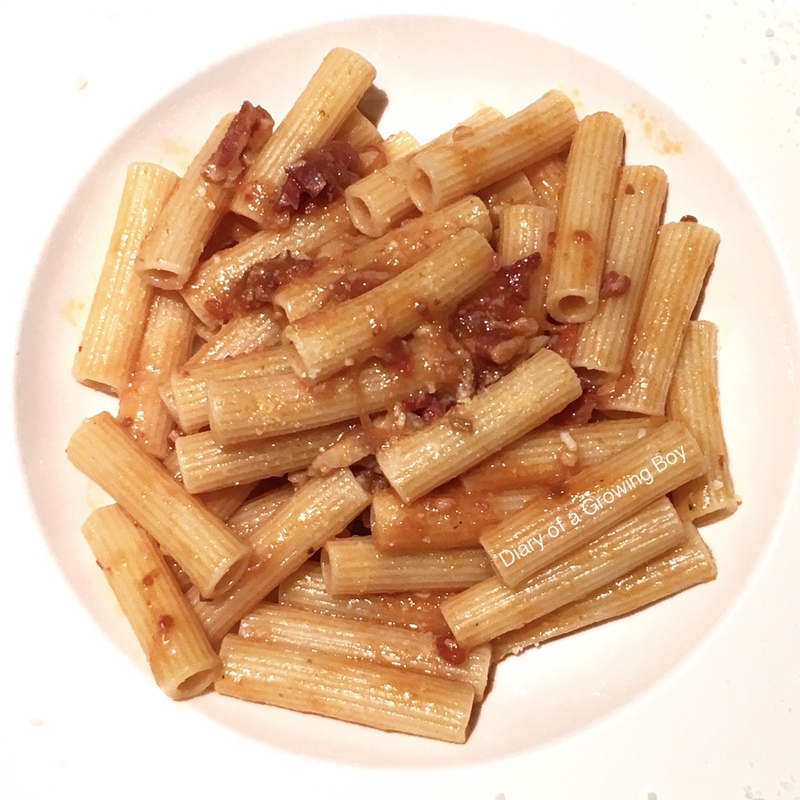 As it happens, I remember distinctly having rigatoni all'amatriciana at Giando a few years ago. So I figured the least we could do is to go and have ourselves some pasta. The dish is part of the restaurant's specials and therefore not part of the set lunch menu. I'd have to order à la carte. Since the restaurant is going to donate 100% of the proceeds, it didn't seem right to come and just have the one dish, as the restaurant wouldn't really be making any profit off of us. So we decided to order starters, too. La melazana alla parmigiana - what a nice surprise! For eggplant Parmesan, this turned out to be much prettier than I expected. And tasty, too! The eggplant mash had nice, smoky flavors. The fresh tomato salsa was refreshing, but the surprise was the minced raw garlic in the middle giving a nice little kick. There were also a small, cheesy chunks, too. Together with thin slices of Parmigiano-Reggiano and a little bit of basil, this made for a really delicious start. We were a little full for dessert, but the restaurant was kind enough to bring us a few little sweet nibbles. This was a very good lunch, and I'm glad to have done a small part to help with disaster relief. Giando will keep up with the donation pledge until September 30, so if you would like a little taste of this classic dish, you, too, can satisfy your hunger at Giando.